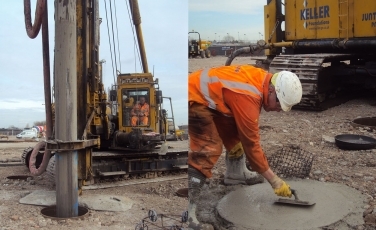 Keller was recently contracted by Readie Construction to install displacement piles for four industrial units which are being built on the site of a former Ford car factory, in Dagenham, UK. Keller operates three displacement systems but has had the most success in this area with Driven Cast In Situ piles, which minimise spoil generation and contamination transfer. The geology of this part of the Thames Estuary is one of various types of made ground underlain by a veneer of alluvial clays, which occasionally have bands of peat. In turn, competent gravels sit beneath, but locally, the gravels can be only 4-5m thick whereupon they are underlain by London Clay. The trick here is to use a pile diameter that enables piles to found in the gravels, otherwise they punch through and would carry much less load in the London Clay. With an offering of diameters ranging from 340mm to 630mm, this means that Keller can often carry most loading situations for industrial buildings in the gravels, and with no spoil generated, this is probably the cheapest pile type in this area. For the floor slab, Keller offered a 900mm diameter enlarged head. One of the major advantages of this is that Keller float finish them to a precise level tolerance, which means there is no intermediate work between the head casting and laying the slab. Heads are placed at +0/-25mm with the levelling controlled by Keller. This is a major advantage in piled floors as the number of piles can be large. During the project, one of the four units had a complication. It was sat near the Channel Tunnel Rail Link (HS1) and a medium pressure gas main. It was decided to adopt a handful of 450mm diameter CFA piles for this area to minimise vibration. Overall, more than 1000 piles at 380 and 430mm diameter were installed during the project, carrying loads of up to 700kN. The project began in February 2017 and ended in April 2017.